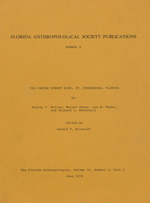 Florida Anthropological Society Publications: Number 9. Ripley had prepared mock-ups and the legends for the figures. and I prepared Figures 3-17, using Ripley's mock-ups and legends. between Canton and 30th Streets South, St. Petersburg, Florida. Fig. 1. Map of Tampa Bay area locating Canton Street site. human skeletal material was encountered. part O to 18 inches and 18 to 30 inches and in part 0-36 inches. given specific depths and in those cases the data were .used. these 23 squares, 11 were only dug to a depth of 24 inches. not present in the Tampa Bay area today. ceramics, projectile points, and tools of bone or shell. regarding similar specimens and comparative data. differences can be seen on incised sherds in Figure 5 where "j_"
(Fig. 3, e-g;, k) to the slightly later limestone tempered wares. of the Tchefuncte culture of Louisiana (Ford and Quimby 1945). a Tchefuncte Plain trade vessel (Ford and Quimby 1945). Fig. 3. Florida Transitional period sherds from Canton Street site. k, St. Johns Incised with undecorated flat bottom. Fig. 5. Various incised sherds. sherd mentioned above was rather deep in the deposit. clay ball from Poverty Point (Ford and Webb 1956:42). ornaments (Figs. 9, i) and as fragments of steatite vessels. Poverty Point in Louisiana (Ford and Webb 1956:111). is finely carved and stylized like the Canton Street specimen. 1967). All are suggestive of similar ceremonialism. Fig. 6. Variations in punctated decoration. plain; h-1, steatite body sherds! Fig. 9. Specimens of bone, stone, and clay. drilled fossil bone; m-o, awls. to the cord at the flattened area. were probably brought to the site as curiosities. shark's tooth in Level 5, they concentrated in Levels 3 and 4.
were used for different purposes. comment also applies to a Macrocallista shell found in Level 6. Table 2. Vertical distribution of shell artifacts. Fig. 10. Artifacts of shell, stone, and clay. distance further north along the Gulf of Mexico. shape variations made classification into subtypes difficult. levels if all squares had been dug to the base of the midden. essentially the same distribution as shown in Table 3. Table 3. Vertical distribution of projectile points. Fig. 12. Basally and corner notched points. Lafayette; i, k, n, Â£, Culbreath. Fig. 13. Stemmed and side notched points. Fig. 14. Various stemmed and corner notched points. Stemmed; r, asymmetric hafted knife. found at the Poverty Point site in Louisiana. Small and large hafted end scrapers are illustrated as "f"
on the bank of the Chattahoochee River in association with St.
date of 1240 B.C. (Bullen 1958:338-339, 341). indicate hafting or that this is another reworked specimen. tions of ovate and asymmetric trianguloid knives (Fig. 16). r, worked tool, use unknown. Fig. 17. Small ovate scrapers. , r-Sy thick scrapers; t, combination scraper-knife. and the other theirs with sand or crushed limestone. present during the closing phases of the Archaic. carryovers from the Orange period subdivision of Archaic times. deposits than those of earlier or later periods. radiocarbon dated about 1260 B.C. County region where these ceramic types are fairly abundant. St.
operations, so that they cannot produce any stratigraphic data. However, they do support the theory of developing regionalism. Island (and Zellwood and Sunday Bluff). paste but originally classified as Tchefuncte Incised (FSM Cat. sherds in the FSM collections in January, 1978. The "Tchefuncte"
techniques, and artifacts diffused over substantial distances. different settlements must have been much greater than we imagine. this pottery type is not the most common. making basally notched Hernando and Citrus points or knives. Ford, James A., and George I. Quimby, Jr.
for American Archaeology, No. 2. Menasha. 1956 Poverty Point, A Late Archaic Site in Louisiana. Natural History, Vol. 46, Pt. 1. New York. Yale University Publications in Anthropology 44. Publications in Anthropology 42. New Haven.